Happy Friday Friends. You may remember this Rebecca Minkoff dress that came in my latest Stitch Fix shipment a couple of weeks back. It's one of the items that I fell in love with, and ended up keeping from my fix. Although this dress is technically from last fall, it will also be perfect for the spring, and I can't wait for the warm weather to arrive so I can pair it with my favorite espadrilles. The problem is that I'm somewhat of an impatient person, especially when it comes to wearing new clothes. 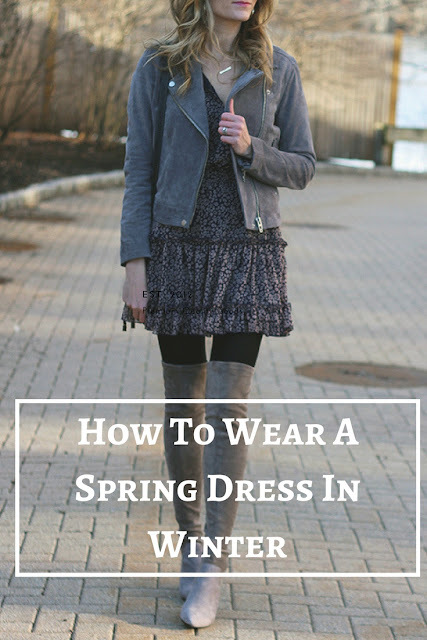 So today I'm showing you how I styled it for the cold weather, and sharing my tips for wearing all of your spring dresses in the winter. 1. Layer your dress with a leather jacket or a chunky knit cardigan. I decided to go with my suede moto jacket because I love how the grey looked against the navy and purple(ish) print. I'm a big fan of pairing leather jackets with feminine dresses, as they add the perfect amount of edge. A chunky cardigan would also be a great option, as it adds a cozy, boho vibe. 3. 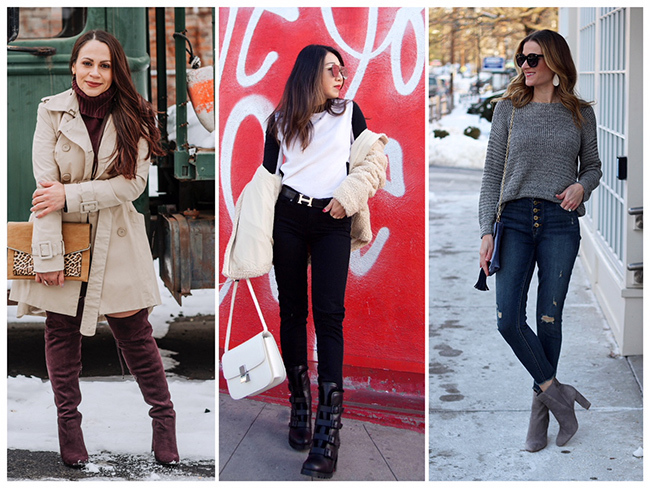 Wear over-the-knee boots. Although a pair of booties would work well too, I love the extra warmth that a pair of OTK boots add. This pair from Goodnight Macaroon is my current go-to. I love how the heel isn't too high, making them easy to run around in, and keep up with two toddlers! They are also currently 30% off (with the code: Classic), so now is the perfect time to snag a pair! However, they do run small, so I suggest sizing up two sizes! 4. Wear tights or leggings. You'll practically never find me wearing a dress in the winter without a pair of opaque tights. My favorite are by Hue, as they always fit, and hold up well. If you want a little more warmth, switch out your tights for leggings. Because they are fitted, most leggings give off the look of opaque tights when paired with boots. I highly suggest fleeced lined leggings, or a pair of faux leather ones. The feature blogger is Grace of Color and Grace. You all know I'm obsessed with the bell sleeve trend, so of course I'm loving her dress. Make sure to stop by Grace's blog to say hello, and get some great petite style inspiration! *This post contains sponsored content and affiliate links. All thoughts and opinions are my own. Thank you for supporting the brands that I love, and that make Threads for Thomas possible. This season, pearls have been all the rage. And I'm not talking about your grandmother's pearls. I'm talking about the pearl embellishments that have been popping up on everything from shirt collars to stiletto heels. Pretty much, you can find the classic gemstone on everything that isn't jewelry, and I'm loving it! 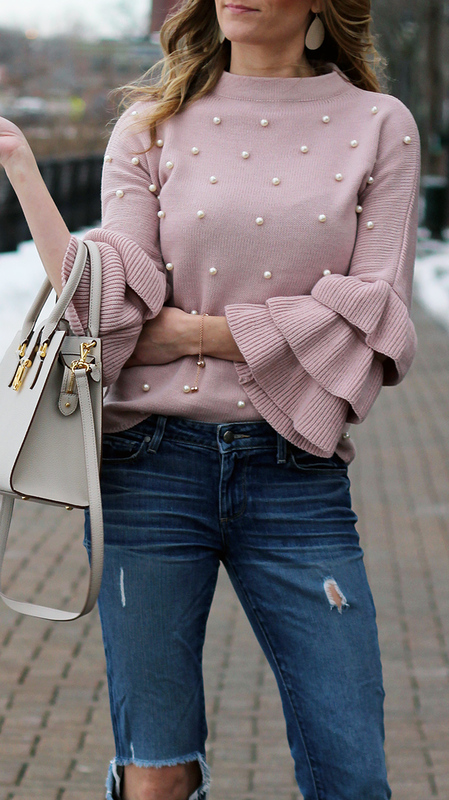 I recently jumped on the trend by adding this pearl embellished sweater to my closet. 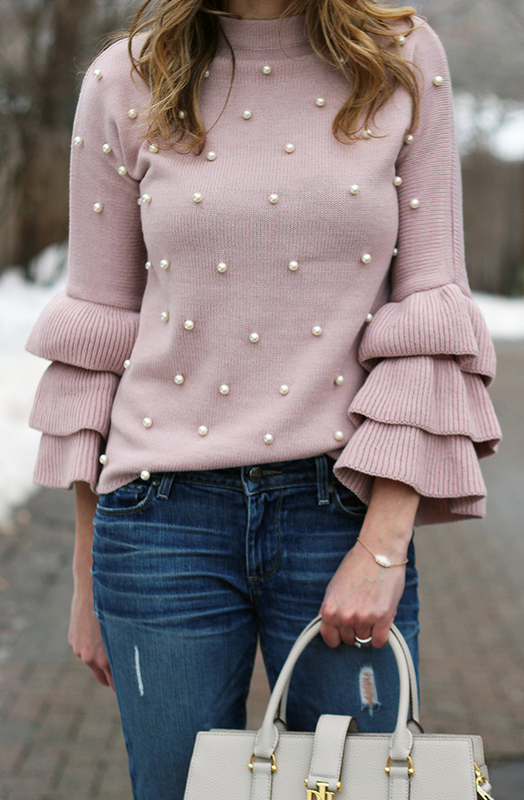 Not only do I love pearl embellishments, but the tiered ruffled sleeves add a fun touch. It's the perfect sweater to take you from day to night, and it's under $25! Plus it's available in six colors. Since I've been on a casual kick this month, I decided to pair my sweater with my favorite boyfriend jeans. They are a couple of years old, but I found them in the same wash, minus the distressing (here), and they're on sale for under $70! I finished my look with my grey booties, that I can't stop wearing. Are you sick of them yet? I wasn't lying when I said they look good with everything, and you'll be seeing me pair them with all of my dresses this spring! Are you into the embellished trend? I hope so, because it's sticking around this spring! I've linked some of my favorite pearl embellished picks below, and everything is under $100. Well, besides the sweatpants, but those were too cute not to share! The feature blogger is Ruth of My Little Nest. How cute is her outfit! I'm loving her chevron tights. Make sure to stop by Ruth's blog and say hello! *This post is sponsored by Stitch Fix. All thoughts and opinions are my own. Thank you for supporting the brands that I love, and that make Threads for Thomas possible. Happy Stitch Fix Friday! Last week I received my January fix, and it's by far my favorite. I know I said that about my last fix, but my stylist nailed it again with my style, and this one was even better! 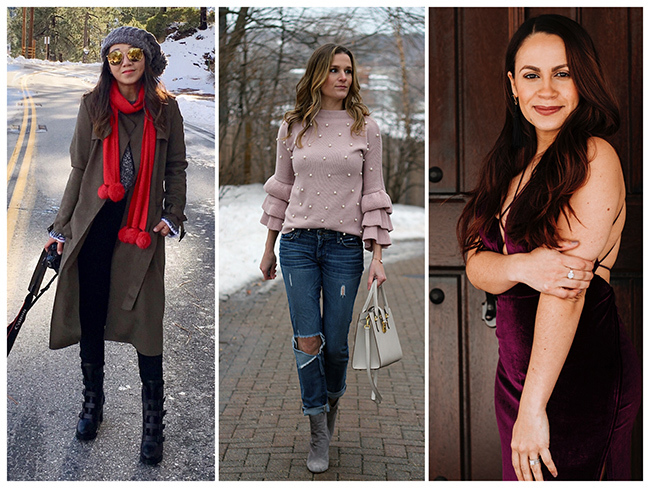 Included in my fix was a Rebecca Minkoff ruffle dress, a Bella Dahl off-the-shoulder top, a twist back sweater by Absolutely, a pair of Pistola button front jeans, and Sole Society pom heels. 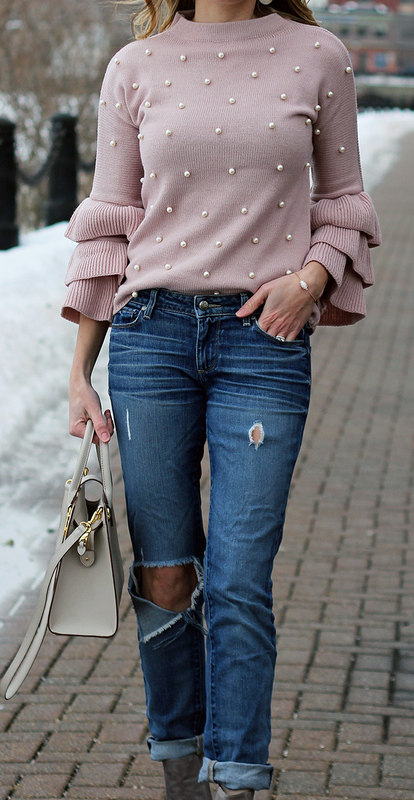 When I received notification from my stylist that she was putting together my January fix, I decided to email her with some requests, one of which was a pair of high rise, button front jeans. When I opened my box and saw that a pair was included, they were the first thing I reached for to style. Lately, I've been leaning towards outfits that are easy and casual, so I decided to pair the jeans with the twist back sweater for a comfy, yet fun, look. I love how this sweater has a classic feel from the front, and an edgy vibe from the back. The best part is that it's bra friendly! I finished my look with my favorite grey booties, and the cutest cross body bag that I got in a previous Stitch Fix shipment. Those who have been following this blog for a while, know that I'm a big fan of Stitch Fix . I have been using the personal styling service for a year and a half, and get excited every time my fix arrives on my doorstep. As a fashion blogger, and shopaholic, I sometimes get asked why I use the service when I'm constantly shopping myself. It's true that Stitch Fix is the perfect service for those who don't have time, or like, to shop, but I love having the eye of another stylist to introduce me to items and brands that I would otherwise overlook. 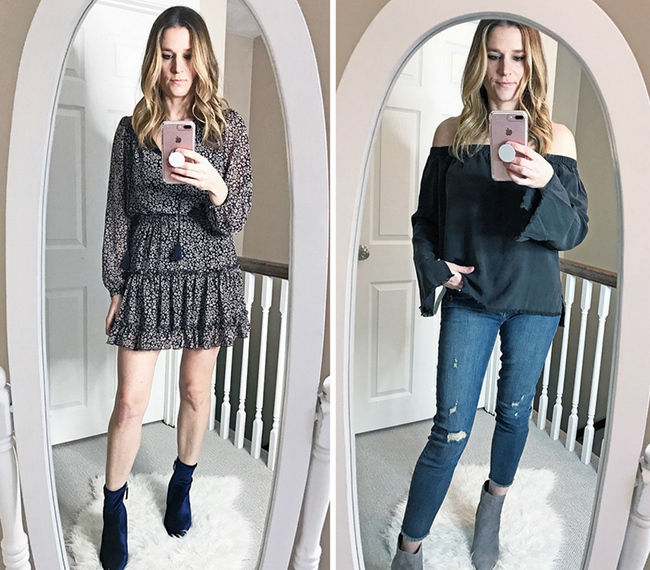 Since using Stitch Fix, I have discovered a great (and affordable) denim line, found one of my favorite sweaters, and have added dresses to my wardrobe that I would have never thought to try on. Whether I'm looking for something trendy, or a classic to last me years to come, I know that I'll find it in my fix. 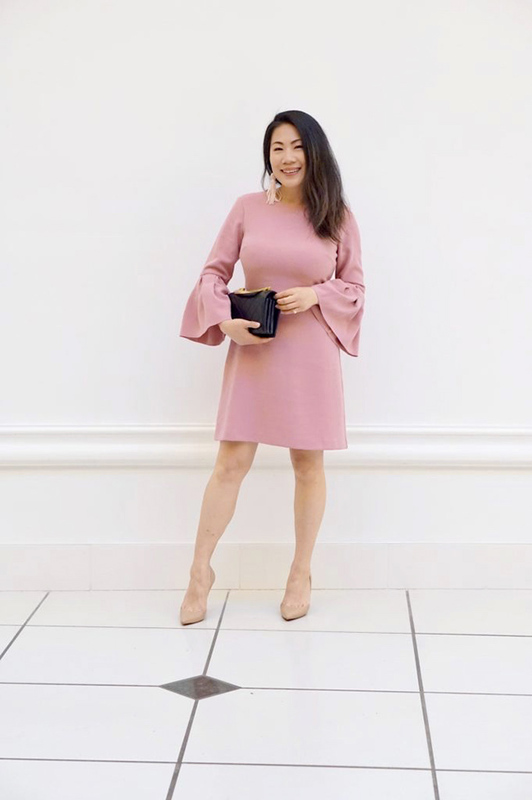 If you're unfamiliar with Stitch Fix , it is a personal styling service where items are picked out based upon your style preferences, and delivered right to your door step. Upon signing up, you are asked questions about your style, then assigned a stylist who picks out five items per shipment to send you. You have three days to try on the clothes and decide what you want to keep or send back. This is the best part about the service, since you are able to do this in the comfort of your own home. You simply keep what you want, and send the rest back in the prepaid shipping bag that is provided. There is a styling fee with each box of $20, however, if you decide to purchase items from your box, then the $20 is put towards your purchase. If you decide to keep all 5 items, then you get a 25% discount! And it's for everyone. Stitch Fix carries women sizes from XS-3X, men's, petite and maternity! The best part is Stitch Fix is waiving the styling fee for Threads for Thomas readers! Try the service risk free by clicking here! Wondering what I kept from this fix? Well, that I'm still deciding.... I know the Rebecca Minkoff dress is a keeper, but I need to make a decision on the rest this weekend. Let me know in the comments what you think I should keep. You can read about my last fix here, and my tips for getting the perfect fix here. Make sure to check out my Insta Stories Highlights to see my try on session, and view the pom heels! The feature blogger is Meagan of Meagan's Moda. I'm loving her cozy, yet stylish look, and she has the best tips for styling oversize dresses. Make sure to stop by her blog and say hello.